Entering the Old Building from Houghton Street, visitors walk beneath the LSE coat of arms selected during the Directorship of William Beveridge. Beveridge was determined that LSE take its rightful place among Britain’s universities, an ambition that led to the purchase of the first LSE sports ground and the adoption of the LSE crest and motto as well as more academic achievements. In 1919 black, purple and gold were adopted as the School colours and towards the end of 1920 the question of an emblem and motto was raised. Initially Beveridge couldn’t decide whether the School needed a simple emblem or a full blown coat of arms. He raised the issue with Sidney Webb in April 1921 but Webb simply replied, “This is beyond me … I am afraid I am useless at all this”. In 1921 the School established a committee to consider the issue. Chaired by Professor Gutteridge, the Sir Ernest Cassel Professor of Industrial and Commercial Law, the committee included LSE founder, Graham Wallas, the School Secretary, Jessie Mair, and eight student representatives. At the first meeting on 24 May the students opposed the use of the monogram and supported the adoption of a coat of arms despite the cost. Indeed in June the President of the Students’ Union agreed to contribute up to £15 towards the costs of enrolling the coat of arms. 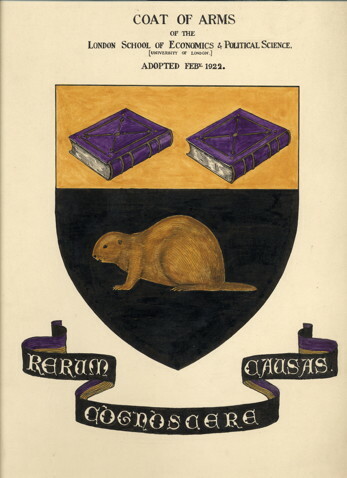 Alongside the coat of arms the School required a motto. The School Secretary had offered a prize of one guinea to the student who made the best suggestion. In fact the challenge was taken up by members of staff rather than students. Twenty four suggestions were received. Abraham Wolf, Professor of Philosophy, included the surely tongue in cheek “Burrow and Build” and “Beaveracious”. Sidney Webb came up with “By Measurement and Publicity” and “Social Service” – neither guaranteed to inspire. Finally Edwin Cannan, Professor of Political Economy suggested “Rerum cognoscere causas” – to know the causes of things, taken from Book 2 of Virgil’s Georgics. The full quotation is “Felix qui potuit rerum cognoscere causas”. 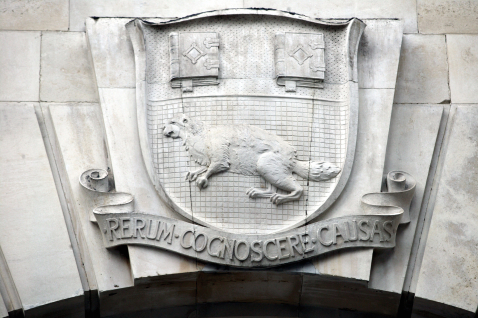 It has been a popular choice although LSE is not the only university to use this motto. Sheffield University took it from a predecessor institution, Firth College, established in 1879 as a science college. It is also the motto of the German newspaper Der Tagesspiegel. The episode was rounded off in 1925 when the staff gave the Students’ Union a wooden beaver carved by Alfred Southwick, a sculptor based in Camden Studios, who worked on the cathedrals at Liverpool and Carlisle. The only possible name for the beaver was Felix. What an illuminating history. Thank you. Felix sure did earn its digs.